-Narrowest point should be no less than 1/2 the overall width. 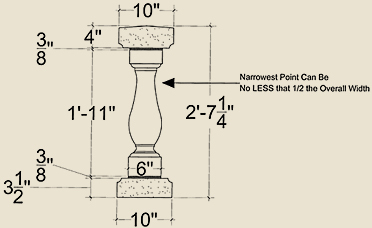 -If possible keep the top and bottom of the baluster the same size, cutting down one end adds cost to each baluster. Note: the 1st baluster top is 5” and the bottom design is 6”. This design requires cutting and will add costs. Our team can produce custom profiles with our carbide tooling experience. Above are examples of baluster design.